Product prices and availability are accurate as of 2019-04-07 11:20:07 EDT and are subject to change. Any price and availability information displayed on http://www.amazon.com/ at the time of purchase will apply to the purchase of this product. Hybrid backup has arrived! 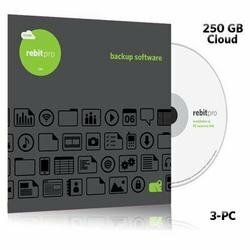 Rebit Pro offers unified Full System Recovery, File backup locally (to USB drive or NAS) and Cloud Backup/Disaster Recovery in one package. Stop managing backups using two different vendors and interfaces. Do it all from within Rebits easy to use interface . Rebit Pro supports multiple, local backup targets comprised of USB drives, or shares on a server or NAS device. There is no limit on the number of backups the software can manage. - Integrated local and cloud backup from a single control panel makes it simple to assure protection without complexity. - Continuous Data Protection insures that no more than 30 seconds of changes are exposed to risk. (CDP to local devices every 30 seconds, cloud synchronization every 2 hours). Versioning is supported. - Much like “time machine” for the PC, recovery points are captured every 24 hours, and all versions of files are maintained to allow the system to be rewound to a previous point in time (before the ‘offending event’ occurred).